“MSI has announced its latest 17″ rig, the GE75 Raider. 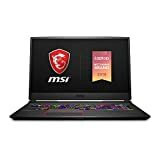 Built with a brand new chassis with diamond-cut cover, which is without a doubt another innovation MSI has.”GE series is for gamers who are enthusiastic in gaming. They have high expectation in both performance and appearance for their weapon-of-choice.” stated by Eric Kuo, MSI Vice President of Global Sales & Marketing. With this in mind, GE75 Raider has reflective diamond-cut trims on a three-dimensional surface with red anodized finish symbolizing the spine of the dragon, showing a unique yet aggressive aesthetic that’s guaranteed to stand out from the crowd. In addition, the GE75 Raider also features an asymmetric pattern at the bottom, to show the futuristic spirit inspired by cosmological warships. The reflective diamond-cut trims form the one-of-a-kind “3D Dragon Spine” design, crafted from a three-dimensional surface with a red anodized finish, showing a unique yet aggressive aesthetic that’s guaranteed to stand out from the crowd. Gains 40% performance enhancement over the previous generation with the extra cores.njoy 40%+ performance improvement with the latest graphics, effectively boosting the fps count. The fastest gaming display brings you the most vibrant visuals for the ultimate gaming pleasure. The Raider comes with Per-Key RGB customization giving you ultimate control over keyboard illumination. Program each key with the SteelSeries Engine 3 application and receive real-time game stats through your keyboard. Dedicated thermal solutions for both the CPU and GPU with a total of 7 heat pipes ensure maximum performance under extreme gaming.